The Cuisinart CSB-100 is a variable speed knob which gives you control of the 700 watts of power, using premium attachments to whisk egg whites, whip cream, chop nuts, shred cheese, and even mash potatoes with the push of a button! The 8.6” stainless steel shaft reaches into bowls, pots, and pitchers, while the 2 cup chopper, 4 cup mixing cup, help you blend and whisk your way through anything. 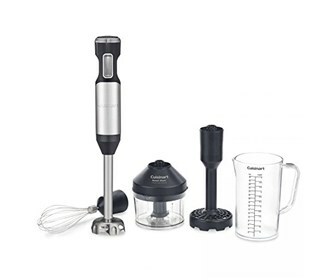 The Cuisinart Variable Speed Hand Blender has many exciting features for users of all types. 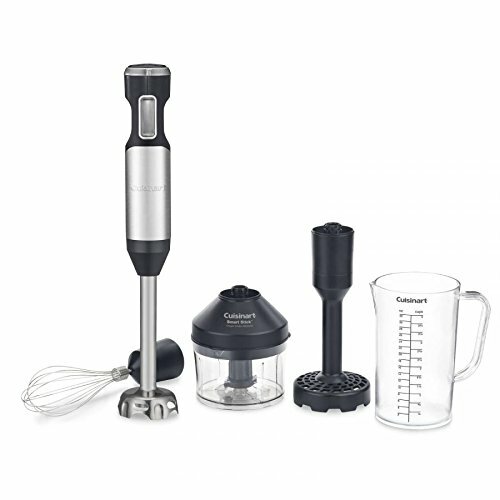 You can extend the lifetime of your Cuisinart Variable Speed Hand Blender with the purchase of a FactoryOutletStore Factory Protection Plan. The Cuisinart Variable Speed Hand Blender is sold as a Brand New Unopened Item.